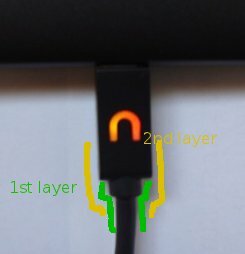 How to fix the infamous Nook Color / Nook Tablet charging USB cable for good? The Barnes&Noble Nook Color / Nook Tablet have a proprietary micro USB charging port which is longer than normal and allows power charging with 2Amps. The charging/data cable from BN is infamous to break after some time, most probably the cable's primary plastic coating is not very flexible and starts to split at the point where it enters the micro usb connector and leads to a visible secondary shielding. If nothing is done the situation worsens and in the end the internal power cables may short. I got my used B&N Nook Color with a beginning coating split and cannot get a replacement from B&N because I live outside the US and have no invoice. Seems like this problem is a common one, there are already discussions about a class action lawsuit. What can I do besides looking for a replacement? I fixed the cable early before it was too late. 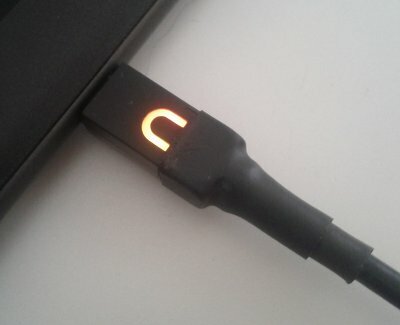 The problem zone is the hard transition from the connector to the cable. Shear force due to moving/bending the cable is very strong there when the cable is inserted into the Nook. This is the place where it starts to break and that needs to be fixed. Add another coating to this transition to reduce shear force. Like the other answer, I too re-inforced a NEW cable, as a pre-emptive measure. I experimented a little with the heat shrink tubing and superglue method, but supergluing the smaller heat shrink tube (which has to be slit in order to put on the cable) is messy, and prone to failure after applying the necessary heat to shrink it tight on the cable. Wrap the tape tightly around the cable itself, on the area closest to the connector, until it is the same diameter as that first (round) stage of the connector. Cut the tape. Next wrap more tape over that area, close as possible to the larger (square) part of the connector, so that it covers both the previous tape wrap plus the smaller round (flange) part of the connector. Wrap tightly until it is about level or possibly a little higher than the square part of the connector. Cut the tape. Next wrap more tape around that last wrap of tape plus part of the square connector, say with the edge right at the "n" LED, with about 3 turns maximum. Cut the tape. All done. Advantages to this method include NOT subjecting the cable end to heat high enough to shrink the heat tubing (and possibly causing other damage). Also you don't need any other equipment or materials besides 3/4" electrical tape and scissors. Wrapping in 3 separate "level" sections keeps the tape from wrinkling, and if wrapped tightly, looks quite neat when done. RECOMMENDATION: Wrap in the SAME DIRECTION for each of the 3 sections, and cut the tape such that tape sections end on the opposite side of the connector's "n" LED. I'd like to add a fun alternative: use some Sugru. It's a flexible silicone rubber which can stick to just about anything and is simply moulded by hand. It air cures to a tough durable rubber. This is a UK invention (I'm sure they now have it in the US), so might be an alternative for us over here. I wasn't smart enough to be preemptive, though I had plenty of warning as the intermittent problem became more frequent and finally failed completely (no wiggling the cord would make it work). So, I opened up the connector on the Nook end (with the "N") and reconnected with solder the two broken leads. This was tricky since the circuit board there is only about 5/16 inch square! There are four conductors: red, green, black and white insulation colors in the cord. Both the black and the white leads were broken off. After testing and reassembly, I wrapped the area with black, stretchy electricians tape to provide better strain relief at that vulnerable site. My problem is not in the cable but in the nook. Looking inside the plug port it appeared at first that some of the male pins were bent, then in time just not there. I called the help line and they said it was non repairable. And of course would give me credited on a new nook. Which amounted to more than just going to Amazon and buying one. Not the answer you're looking for? Browse other questions tagged hardware nook-color or ask your own question. Is there any good micro USB cable (not loose)? How to change default PDF viewer on Nook Color? Gingerbread ROM for Nook Color? What is the difference between running/installing cm7 off SD and EMMC for Nook Color? Can I use an Android OS card on the new Nook Tablet? How can I load a Video Player App on my Nook Color without google play?